The new Jurra down jacket provides great warmth and insulation during the winter months and with the new women's cut and fit, will make you look great too. With an 80/20 Duck Down Feather mix and 600 fill power the Jurra will be just fine worn on its own (like the sound of this), over a base layer or as part of a full layering system when temperatures dip to around zero. 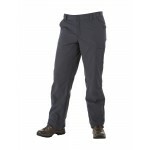 Other features include a wind resistant Airfoil ripstop polyester outer with water repellent finish, plain weave nylon lining, full length centre front zip, fixed hood with stretch binding to the edge, two zipped hand warmer pockets, stretch binding to cuffs, elasticated hem drawcord, shaped quilting stitch to enhance feminine lines. Berghaus Jurra Women's Down Jacket.